See BigQuery Connector for information on installing the BigQuery connector. The BigQuery connector can be used with Apache Spark to read and write data from/to BigQuery. This page provides example code that uses the BigQuery connector with Spark. 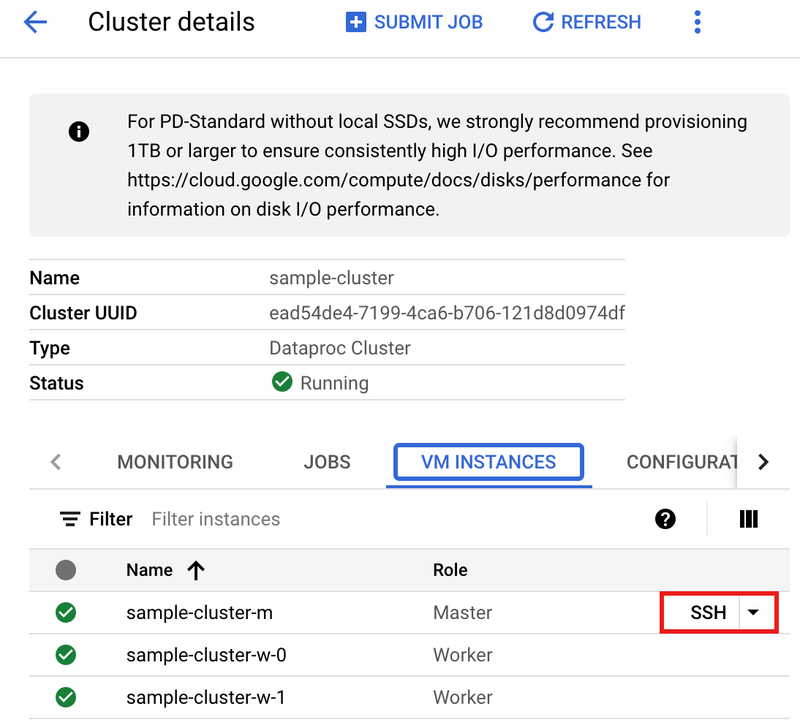 See the Cloud Dataproc Quickstarts for instructions on creating a cluster. 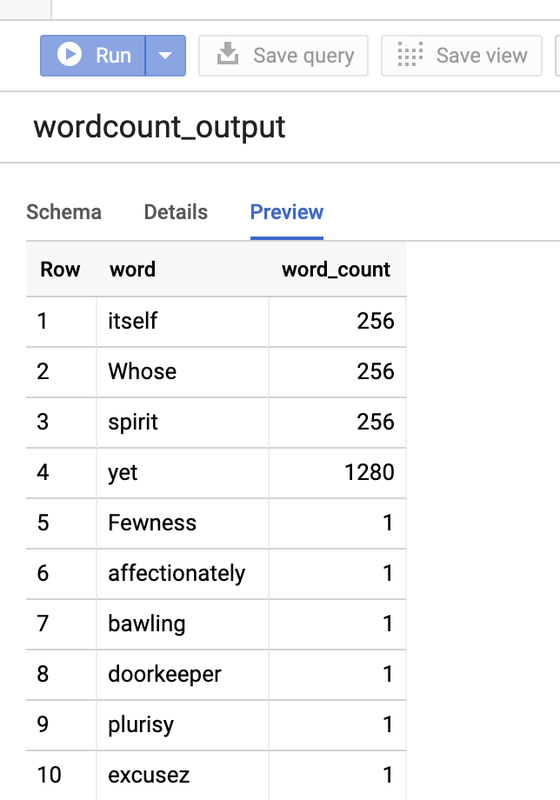 This example reads data from BigQuery into Spark to perform a word count using SparkContext.newAPIHadoopRDD (see the Spark documentation for more information). It writes the data back to BigQuery using PairRDDFunctions.saveAsNewAPIHadoopDataset. IndirectBigQueryOutputFormat provides Hadoop with the ability to write JsonObject values directly into a BigQuery table. This class provides access to BigQuery records through an extension of the Hadoop OutputFormat class. To use it correctly, several parameters must be set in the Hadoop configuration, and the OutputFormat class must be set to IndirectBigQueryOutputFormat. Below is an example of the parameters to set and the lines of code needed to correctly use IndirectBigQueryOutputFormat. IndirectBigQueryOutputFormat works by first buffering all the data into a Cloud Storage temporary table, and then, on commitJob, copies all data from Cloud Storage into BigQuery in one operation. Its use is recommended for large jobs since it only requires one BigQuery "load" job per Hadoop/Spark job, as compared to BigQueryOutputFormat, which performs one BigQuery job for each Hadoop/Spark task. // Assumes you have a spark context (sc) -- running from spark-shell REPL. // only be necessary in spark-shell REPL. val outputTableId = projectId + ":wordcount_dataset.wordcount_output"
// Temp output bucket that is deleted upon completion of job. // Let BigQuery auto-detect output schema (set to null below). // (Optional) Configure the KMS key used to encrypt the output table. // Truncate the table before writing output to allow multiple runs. // Helper to convert JsonObjects to (word, count) tuples. // Helper to convert (word, count) tuples to JsonObjects. // Load data from BigQuery. // Write data back into a new BigQuery table. // IndirectBigQueryOutputFormat discards keys, so set key to null. Launch the spark-shell REPL (remove jars parameter if using Cloud Dataproc 1.0-1.2). Run wordcount.scala with the :load wordcount.scala command to create the BigQuery wordcount_output table. The output listing displays 10 lines from the wordcount output. To preview the output table, open your project's BigQuery page, select the wordcount_output table, and then click Preview. Indirect BigQuery import PySpark cannot use the BigQueryOutputFormat to directly load data into BigQuery because, unlike Scala Spark, it cannot create Java GSON JsonObjects inside a map. This example loads the data into Cloud Storage, then invokes a bq command to load the result into BigQuery. Alternatively, you can create a org.apache.spark.api.python.Converter to create the JsonObjects (see these examples for more information). Temporary file cleanup: This example includes a best-effort cleanup of temporary files in Cloud Storage created by the BigQueryInputFormat. If the job fails, you may need to manually remove any remaining temporary Cloud Storage files, BigQuery datasets, and BigQuery tables. Typically, you'll find temporary BigQuery exports used by InputFormat in gs://bucket/hadoop/tmp/bigquery/ and temporary datasets named after your specified output dataset with a hadoop_temporary_job_[jobid] suffix. # Load data in from BigQuery. # Stage data formatted as newline-delimited JSON in Cloud Storage. # Shell out to bq CLI to perform BigQuery import. # files will remain indefinitely. Run wordcount with spark-submit to create the BigQuery wordcount_output table. The output listing displays 10 lines from the wordcount output.